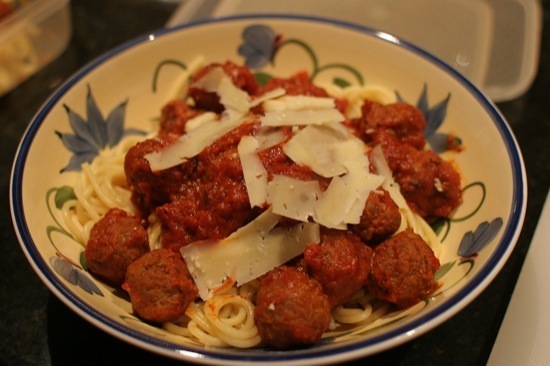 No, it wasn’t mine, but tonight we really enjoyed having home made parmesan on our spaghetti and meatballs. Gavin, from The Greening Of Gavin fame, recently held a competition to name his new home-made cheese blog (the cheese is home-made; although I guess the blog probably is too). Since he’s a big greenie, and as a play on his main blog name, I suggested he name the blog Green Cheese. Gav liked the name but it was taken, so it became Little Green Cheese. The prize for picking the winning name was a chunk of home-made parmesan. I wasn’t sure how that was going to go in the post from Melbourne, but it arrived safe and sound. I was a bit nervous about wasting it, and wanted to keep this special cheese for a worthy meal. Tonight I made Tuscan meatballs on spaghetti, and we finally had to opportunity to break out the parmesan. What can I say – yum! The cheese was excellent! If you’re interested in how parmesan is made, Gav has a recipe and instructions on his new site – making parmesan. Cheesemaking is something I’d like to try, but I have so many other projects on the go that I don’t want to take on a new hobby that I know I’ll become obsessed with! If only there were more hours in the day :-). Have you ever made cheese? How did it go? Do you make it regularly? Glad you liked it Darren. I love the flavour of this cheese. @Gav: It’s truly top-shelf stuff, Gav. You’ve obviously got it down to a fine art, and I highly recommend it to anyone! @Todd: That sounds really interesting – you’ll have to make it the next time you’re down the coast! Butter chicken is one of my favourites too, so bring the Indian recipe book :-). We could have a go at making naan to go with it.